Digiflavor Fuji GTA Single Coil Version with 25mm diameter for a so large e-juice capacity 6ml. It will provide more pure cloud and nice flavor. Black and silver color for your choice. 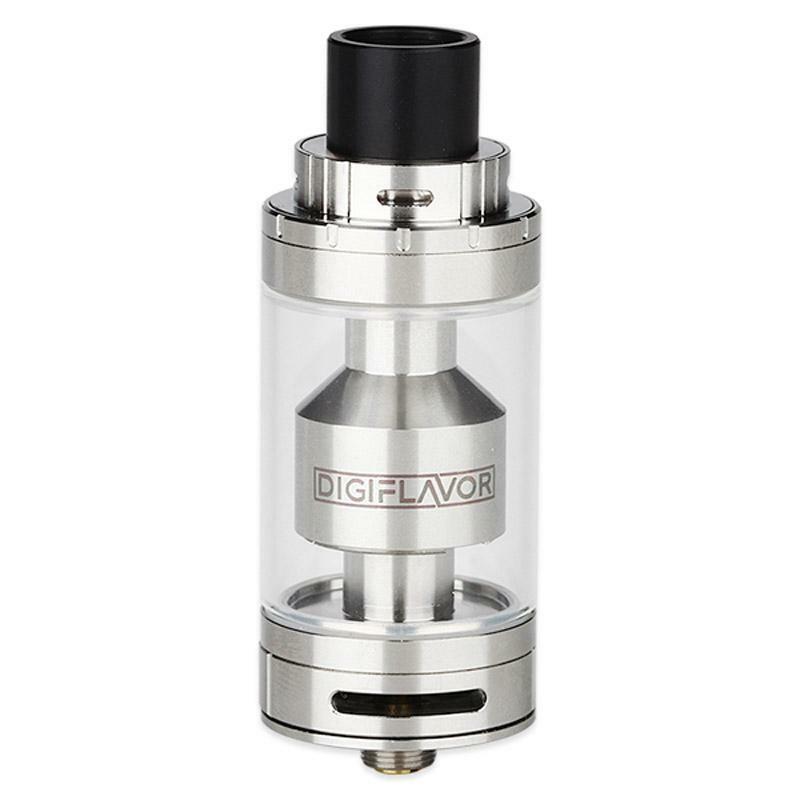 Digiflavor Fuji GTA Atomizer Single Coil Version with 25mm diameter for a so large e-juice capacity 6ml. It comes with replacement glass tube. Its GTA structure with chamber closer to drip tip will provide more pure cloud and nice flavor. When you use this Fuji GTA atomizer, Airflow straight to coil, and it is easy to wick. It is the best choice for those vapor lover. Black and silver color for your choice. Good quality, price and performance with very competitive price thankfully to BuyBest. Digiflavor Fuji GTA Single Coil Version - 6ml – Black.This is one of my favorite RDTA tanks with single coil. The build deck is large enough to fit any coil that you can imagine such as juggernaut coil and to work properly below 0.2 ohms. There isn’t compromised the flavor witch is same as many flagship tanks. Is easy to build there is no leakage if you put enough cotton but not too much, the airflow is sufficient for Mouth To Lung but isn’t very restrictive. For Direct To Lung you can build various coils and achieve good battery economy even for mods that are single battery. Aditional top airflow can provide better flavor with decent amount of vapor production. Probably the best online shop with great deals on flash sales, promotions, weekly deals, SMOK deals which are my favorite selection. For every purchase the client is rewarded with points which can be exchanged in point mall. My opinion is that BuyBest should allow clients to exchange their points directly in cart (for regular deals) no more than 20 percent of value of the product. Or adequate amount of points to be exchanged in additional selection with Coupons that client can use during checkout. This will be very attractive and interesting option to attract the client and to harden their loyalty. Fast secure shipping and free from orders above 20 usd. Depends of the region the shipping in central Europe is approximately 14 days. The items are shipped maximum within 24 hours from clearing the payment. Good quality, price and performance with very competitive price thankfully to BuyBest. Digiflavor Fuji GTA Single Coil Version - 6ml – Silver. This is one of my favorite RDTA tanks with single coil. The build deck is large enough to fit any coil that you can imagine such as juggernaut coil and to work properly below 0.2 ohms. There isn’t compromised the flavor witch is same as many flagship tanks. Is easy to build there is no leakage if you put enough cotton but not too much, the airflow is sufficient for Mouth To Lung but isn’t very restrictive. For Direct To Lung you can build various coils and achieve good battery economy even for mods that are single battery. Aditional top airflow can provide better flavor with decent amount of vapor production. Probably the best online shop with great deals on flash sales, promotions, weekly deals, SMOK deals which are my favorite selection. For every purchase the client is rewarded with points which can be exchanged in point mall. My opinion is that BuyBest should allow clients to exchange their points directly in cart (for regular deals) no more than 20 percent of value of the product. Or adequate amount of points to be exchanged in additional selection with Coupons that client can use during checkout. This will be very attractive and interesting option to attract the client and to harden their loyalty. Fast secure shipping and free from orders above 20 usd. Depends of the region the shipping in central Europe is approximately 14 days. The items are shipped maximum within 24 hours from clearing the payment. Quality huge reservoir sooooo easy to set it up FLAVOR! I am soooo happy i made the decision to buy this beauty! A very good RTA, cheap to make a good coil. no leaking. very good tank! Excellent. Thank you Buybest! Product is quality. I'm very satisfied. Everything super :)! Great atomizer, well built and robust. Ich habe Digiflavor Fuji GTA Single Coil Version gekauft da es genau das hatte was ich wollte und sogar noch mehr. Zwei Akku mods sowie zwei Tanks mit Verdampfer und liuqids perfekt. I just bought Digiflavor Fuji GTA for some days. This tank is great. I use it every day. It's very durable and can take a beating. I highly recommend it.